Two months after the opening of Ark of the Stars in December, it shifted from theatrical screenings to net delivery. February continued the general slowdown seen in January, but also brought new product announcements, new online activity, and a major new concert that kept the Yamato spirit high. Here’s a roundup of all the February action. This latest figure from Megahouse’s Yamato Girls Collection captures Yuki in the last moment before zipping up, evidently stepping through a low doorway. She has a detailed helmet and an optional head for two different expressions and hairstyles. This is Megahouse’s fourth Yuki Mori following the original version, the nurse version, and the bikini version (as seen in previous reports). And they’re not done with her yet (keep reading). See extensive photos of this figure at the Megahouse website here. Bandai Visual released a batch of promotional messages in early February, starting with one on Feb 2 for the upcoming Yamato 2199 Concert 2015. See it on Youtube here. A pair of commercials for the Ark of the Stars video release followed on Feb 3, both featuring similar footage but different music. See the opening song version here and the end song version here. There was also a longer 2-minute promo in the form of a theatrical trailer; see it here. Kodai’s voice could also be heard on sightseeing boats at Matsushima from mid February to the end of March, replacing that of Yuria Misaki (voiced by Aya Uchida since the tours began in summer 2014). Taking place in the city of Chiba (about half an hour outside Tokyo), the first big hobby show of the year always features early sightings of forthcoming Yamato products. This time, Megahouse took the spotlight, starting with their display Cosmo Fleet Special miniatures. On hand were all the existing ships in the lineup with four new ones unveiled for the first time: a metallic “Cosmo Reverse” Yamato, Mirangal and Nilvades battle carriers (from Ark of the Stars), and the UX-01 Dimensional Submarine. Release dates are not yet known as of this writing. Elsewhere in the Megahouse booth was a bevy of Yamato Girls figures, featuring the prototype for Akira Yamamoto version 2 (due in July) and an image of the next Yuki Mori figure, in her Iscandar dress. Presumably it will come with a non-battle-damage option. See more photos of the Megahouse booth at Dengeki Online and Tag Hobby. Cosplayers did their part to keep Yamato alive at Wonderfest, and you’ve always got to give it up for someone willing to go blue for a day. …and a return appearance of the 1/8 Akira Yamamoto by the same company. At right is a set of Garmillas character busts, marked down from last year. Official merchandise could be found as well, at a booth operated by Yamato Crew and garage kit maker Ndopara. This digest-size magazine from Yosen Co. published a 6-page article on Yamato 2199, which may turn out to be the last one for a while. It contained an interview with Producer Mikio Gunji about Ark of the Stars and his inside observations on the 2199 experience. Hikari TV was one of the four streaming services that would offer Ark of the Stars on March 21, adding it to the rest of the Yamato 2199 lineup – all seven theatrical chapters and A Voyage to Remember. Volume 83 of the monthly Hikari TV Guide commemorated this with a cover and the double-page spread shown below. On this day, 2199 Composer Akira Miyagawa (and his interesting hair) appeared on Youtube in a brief message inviting Yamato fans to attend Concert 2015, which was now less than two weeks off. See the message here. The dramatic image of Miyagawa shown above right occupied the home page of the official 2199 website about a week earlier. It was originally created for the November 2012 concert. In November 2014, a collaboration was announced with Japanese telecommunications company NTT. The dual theme of this tie-in is high technology and environmental protection, and the plan is to use the characters and images to promote the company’s services. An interesting result of that collaboration made its debut on the NTT X Yamato website on Feb 16: the introduction to a Spinoff Side Story that has since become a monthly ongoing feature. The year is 2199. The human race is on the verge of extinction. The United Nations space navy places all its hopes in the Yamato Plan, and in the minds of the people involved, the biggest concern is, “What if Yamato is attacked by Garmillas during the mission, and its navigation is disabled by accident?” In that case, the human race would lose its last hope, and the operation to rescue humanity would be completely lost. Moreover, on the 168,000 light-year journey to reach the Large Magellanic Cloud, Earth would have no way of confirming Yamato‘s safety. Could Yamato launch without taking some steps to address this? How would those left behind to wait maintain their own stability? As the launch of Yamato drew closer, everyone in the UN space navy began to speak about this at last. Before Yamato was scheduled to launch on a certain day in 2199, the Chief of Staff of the 9th strategy division within the information technology section of the UN space navy chose two high-grade technology officers to board Yamato: Shiro Sanada of the information section and his junior Kaoru Niimi. In cooperation with the information technology section, Administrator Heikuro Todo of the Earth Federation’s Far East District and leader of the Yamato Plan Division, commissioned a report within 72 hours on how quickly and efficiently Yamato could recover its navigational ability, assuming the ship’s system sustained accidental damage from an enemy attack. A familiar sigh escaped from Niimi’s mouth. Sanada muttered this while leaning against the wall of the high-speed elevator leading down to the lower levels of the information technology section, deep underground where the human race had fled to survive. The elevator stopped. When the door opened, it revealed information terminals covering the walls of the underground space. Here, human beings had developed the largest databank in the history of information processing technology. Even if times change, human ideas are the same. The goals are the same. NTT’s 2199 tie-in appears to go beyond the digital world as well. Twitter user “Hat Mata” posted these images on February 17 showing a set of NTT X Yamato 2199 clear files. The 1977 Yamato movie famously got a promotional boost from guerilla marketing, in which fans were given materials to spread awareness of the film. Twitter seems ready-made to serve as a modern equivalent, as demonstrated by this digital campaign. 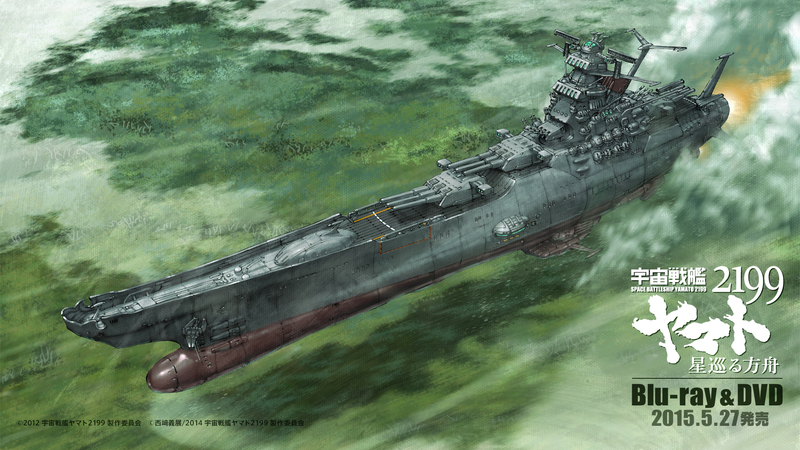 In order to help raise awareness of the upcoming video release of Ark of the Stars, The Yamato 2199 Production Committee asked Twitter users to describe how they’d like to use Yamato‘s ultimate weapon with the hashtag “I want to fire the Wave-Motion Gun” from February 16 to the end of March. In return, participants would be entered into a prize lottery for home video equipment, Dr. Sado booze, an aroma diffuser (shown above right) or a towel set. Winners would be notified by direct message afterward. See the campaign website here. On this day, the movie could be watched on demand in Japan via four different streaming services: Bandai Channel, Playstation Store, Hikari TV, and Rakuten Showtime. It could be seen in HD for 1300yen or standard-def for 900yen. Always looking for an opportunity to promote the home video release, Bandai Channel offered smart phone wallpaper (above right) for download. This larger version was made available for use as PC wallpaper. The image is a painting by Kia Asamiya, one of several seen in earlier reports. Get it (while you can) here! The Nico Nico Ace and Comic Walker websites both published this new chapter by Michio Murakawa, which sets up his adaptation of TV episode 15. At a mere four pages, it is definitely his shortest chapter yet, but after delivering his staggering one-two punch in January, Mr. Murakawa has earned a break.